Chairman Park Sung-taek of Korea Federation of K-biz. 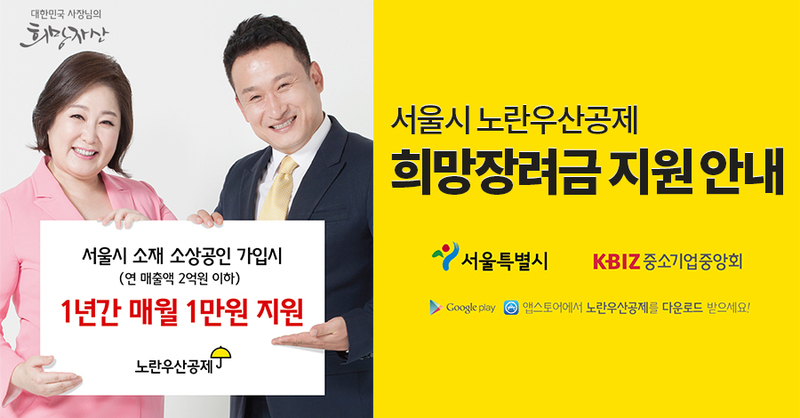 The Korea Federation of K-biz has been trying to help small business owners become members of the Yellow Umbrella Deduction Cooperative Hope Encouragement Fund through the Yellow Umbrella Mutual Aid Fund, which has been set up to extend its run to Gwangju from Oct. 29 this year. The hope encouragement fund kicked off its operation in March 2016 in Seoul and spread to Jeju Island this year, the Ulsan Metropolitan City, the South Gyeongsang Province, and the Gwangju Metropolitan City. The local provincial administration will pay 10,000 won per month for a year to member firms in cities and provinces where the cooperative is in operation. A SME whose annual sales are 200 million won or less can apply for the membership for the fund. Exec. Director Yoo revealed that the new members of the cooperative get a shopping bag and a 10,000 won coupon for markets from July 15 under the K-biz program to help traditional markets and domestic farms by buying their produce. K-biz has also been giving discounted hotel room coupons to some 1,000 members of the Yellow Umbrella Deduction Cooperative so they can stay at one of six resorts around the country. Nine autonomous local administrations including Busan, Incheon, Daejeon, Gyeonggi Province, Gangwon Province, South and North Chungcheong provinces and South and North Jeolla provinces will be paying the Yellow Umbrella Hope encouragement Fund from next year to cover the entire country. Chang Wook-jo, director of the Headquarters of the Yellow Umbrella Mutual Aid Fund, said the hope encouragement fund has been set up to lead the poor SMEs to join the fund as members so that it can help the social safety net and we should do everything to expand it by securing government support. They can apply for the membership of the deduction cooperative at the 13 banks and financial institutions in the country including KEB -Hana Bank, KB Kookmin Bank, Woori Bank and the Industrial Bank of Korea, Shinhan Bank, NH Bank, Jeonbuk Bank and Jeju Bank and the Korea Post, the Korea Federation of K-biz, among others. In the meantime, the Korea Federation of K-biz held a speech session for former Israeli PM Ehud Olmert at its head office building in Yeouido, Seoul, on Oct. 30, as part of its Global New Business Strategy with Israel, the global start-up country. The former Israeli PM in his speech said both Korea and Israel should get ready for the new industrial technologies such as blockchain, and a new era in the automotive industry, which will be dominated by the driver-less cars. Korea, with its world leading auto industry, should cooperate with Israel with its revolutionary ideas to get ready for the future. He stressed that Israel will go for the new businesses emerging in the future. 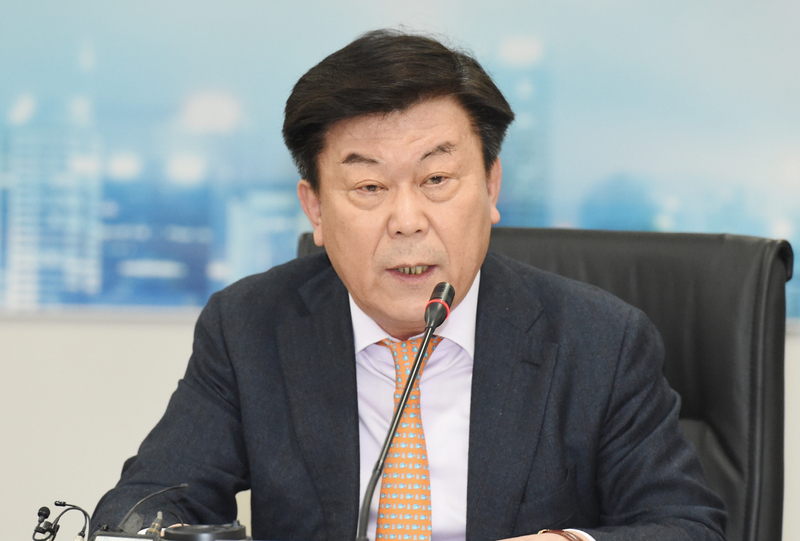 Chairman Park Sung-taek said SMEs should do everything to cope with the emerging changes in the growth engines by investing in them wisely, which is very critical for our future. Small and medium-sized businesses are the root of the economy and account for 99 percent of the number of enterprises and 88 percent of all employees. They play a pivotal role in the national economy. Kbiz was established in 1962 under the objective to improve the economic status and support equal opportunities for Korean SMEs. “We have actively dealt with the rapidly changing global economy through making proposals on governmental policies and seeking various systems, while also providing support so that SMEs can enhance competitiveness.” they said. Also, we supported overseas marketing through participating in foreign exhibitions for SMEs, dispatching overseas business delegations, and providing information concerning FTA. 중소기업중앙회는 영세 소상공인의 노란우산공제 가입을 지원하기 위한 ‘노란우산공제 희망장려금 사업’을 ‘18.10.29일부터 광주광역시도 실시한다고 밝혔다. 희망장려금 사업은 ‘16년 3월 서울시를 시작으로 ’18년에 제주도, 울산광역시, 경상남도, 광주광역시로 확산되어 5개 지자체에서 실시하게 되었다. 노란우산공제 희망장려금 사업은 사업시행 지자체에 소재한 연매출액 2억원 이하의 소상공인이 노란우산공제에 가입할 경우 해당 지자체에서 1년간 매월 1만원씩 장려금을 지원해 주는 제도이다. 중소기업중앙회는 가입자가 납부하는 부금과 함께 연복리로 적립하고 폐업 등으로 공제금을 신청할 경우 장려금을 가산하여 지급해 주고 있다. 사업 시작 이후 약 6만 명의 소상공인에게 희망장려금을 적립해 줌에 따라 경영악화, 폐업 등의 위기에 상시 노출되어 있는 소상공인의 사회안전망 확충에 도움을 주고 있다. 한편 노란우산공제는 재적 기준 106만 명이 넘는 소기업․소상공인이 가입하였고 폐업 등으로 공제금을 지급받은 가입자도 21만 명을 넘어서는 등 소상공인의 사회안전망 역할을 톡톡히 해내고 있다. 이에 부산・인천・대전・경기・강원・충북・충남・전북・전남 등 9개 지자체에서도 내년부터 노란우산공제 희망장려금 사업 실시를 검토하고 있어 희망 장려금 사업이 전국적으로 확산될 것으로 보인다. 정욱조 중소기업중앙회 노란우산공제사업본부장은 “희망장려금 사업은 영세 소상공인의 노란우산공제 가입을 유도하여 사회안전망 구축에 도움을 주는 사업이기에 정부 차원의 지원 등을 통해 희망장려금 사업이 더욱 확대될 수 있도록 최선을 다하겠다”고 말했다. 부가서비스로는 단체상해보험 지원(가입후 2년간, 최대 월 부금액 150배까지), 법률, 세무, 지식재산, 노무, 회계 등 전문가 무료 상담, 휴양시설(호텔, 리조트 등) 할인가격 이용 지원, 의료시설(대학병원, 건강검진센터), 렌터카 등 할인가격 이용 지원한다. 가입방법은 하나·대구·광주·부산·경남·국민·기업·우리·신한·농협· 전북·제주은행, 우정사업본부 등 (13개) 금융기관과 중소기업중앙회, 공제상담사, 콜센터(1666-9988), 협동조합 등을 통해 가능하며, 노란우산공제 홈페이지, 스마트폰 앱으로도 가입할 수 있다.